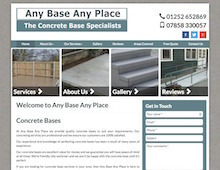 Any Base Any Place provide high quality concrete bases to fulfil your specific needs, whether that’s concrete driveways in Guildford, imprinted concrete drives in Farnham, concrete patios in Aldershot, or concrete bases for sheds, log cabins and garden rooms in surrounding Surrey & Hampshire areas. Any Base Any Place use quality materials to provide a durable, long lasting surface for their concrete driveways. Imprinted concrete drives are one of the most popular options, with the use of imprinted concrete providing a variety of design options to enhance the style of your house. Concrete floor screeding is a thin layer that can be applied to a pre-existing concrete base, often used for underfloor heating. It provides a versatile, durable flooring option. Using the best quality materials, Any Base Any Place offer a variety of concrete options for paths and patios. So if you’re looking for a concrete path in Guildford, imprinted concrete patios in Aldershot, or any of the other concrete base services available, contact Any Base Any Place today.